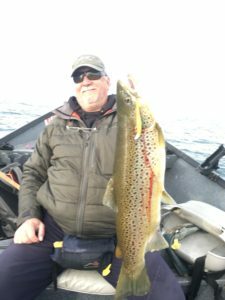 Lake Charters Archives - Angling Adventures Lake Charter & River Guide Service Pulaski, NY. 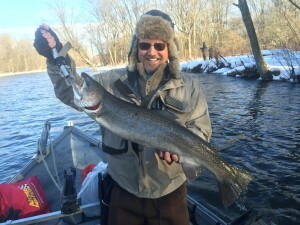 Angling Adventures Lake Charter & River Guide Service Pulaski, NY. I know it’s been quite a while since my last post, but we have been very busy. 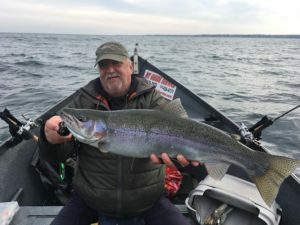 The salmon fishing on Lake Ontario is currently red-hot and has been the best I’ve seen in at least the last 5 years as we progress through July limit catches are taking place daily. 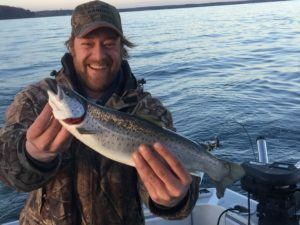 The Lake has also been producing a fairly steady amount of steelhead and our fall winter fishery is currently looking very promising and hopefully not the slow grind that we experienced the last 2 years, it does appear that our comeback is taking place and I’m excited. 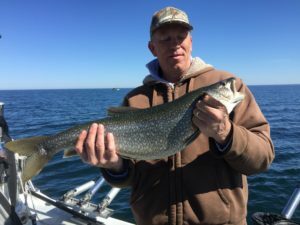 We currently have openings on the Lake boat from now right on through mid-September or even later conditions permitting, we try to run both a.m. and p.m. charters so give us a call for availabilities if you would like to get in on some of this great fishing. 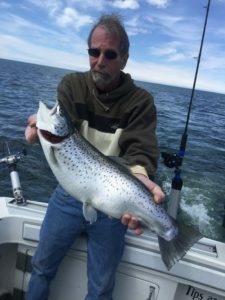 Our fall calendar for salmon is almost full and we only have a couple of days left available due to cancellations and nonpayment of deposits. October 10 11 12 14 15 and the 23rd through the end of the month. 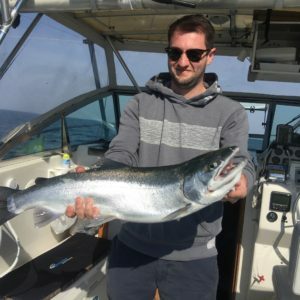 By the 23rd we should be seeing the bulk of our steelhead coming in and that would most likely end up being our primary target. Hard to believe but it seems spring is here, If everything goes to plan our lake boat “the Seaduction” will be splashing down in its new early home port in Sodus bay at Krenzer Marine. 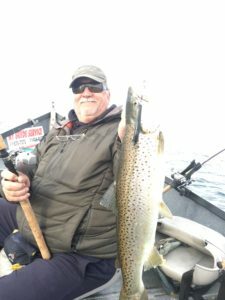 Normally the Brown trout fishing in that region is phenomenal hence our move. 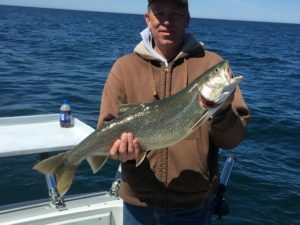 Our calendar is starting to fill but there are still plenty of openings we plan on staying there as long as the fishing opportunities remain best for our clients and will most likely remain in Sodus until June. 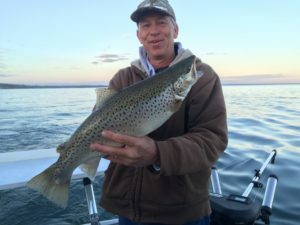 We still have a good number of openings for the spring Brown trout charters on the Lake and a few prime days in April still remain for either the lake or the Salmon River in Pulaski. For smaller groups, one or 2 people only. 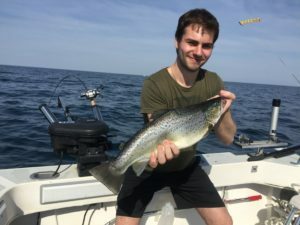 We offer a more affordable package in our smaller boats on the south east shore these trips can be very productive for Brown trout given wind direction and water temperatures with catch rates every bit as good and sometimes even better than the big boat. 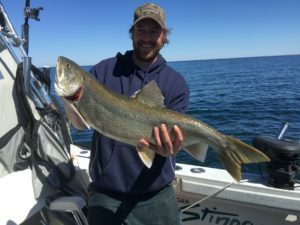 We have our spring calendar organized and we are now taking bookings for the big Lakes 2017 season. 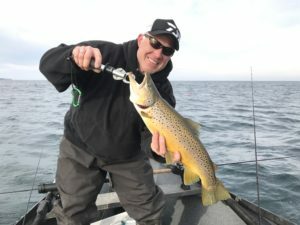 We are hoping to have the big boat on the water by April 1 to pursue our trophy Brown trout as our picture show we found them and they will be there in the spring. 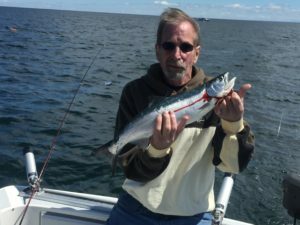 Hard to believe but once again we find ourselves looking at the end of summer and the arrival of our annual King and Coho salmon runs. For the 1st time in roughly 3 years I am truly excited with the outlook of this fall. 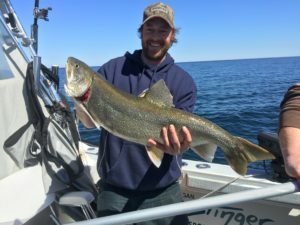 Spending countless days on the Lake, both chartering and playing I have seen very positive signs of the increasing health in our fisheries. 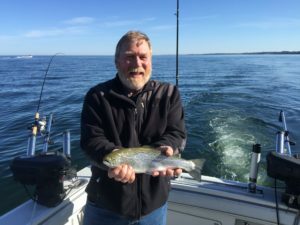 As of this moment there are very very good numbers of both adult King and Coho salmon anywhere from 90 feet to 150 feet out in front of the salmon River. 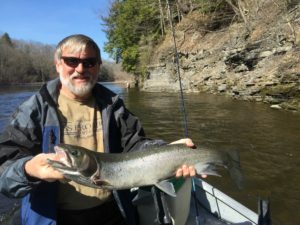 Also this summer we caught an ample number of steelhead which appear to be quite healthy and averaging roughly 8+ pounds, this is a good thing as the last 2 summers on the Lake produced very few steelhead hence the poor returning runs on the River last fall. 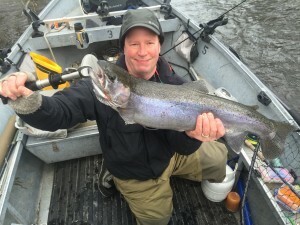 I feel quite confident that our steelhead season this year is going to be quite the improvement from last. 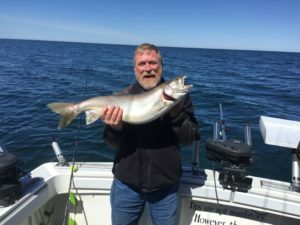 Although my personal calendar is basically full for this fall salmon season I do have a 2nd boat that is available with plenty of open dates for salmon season. Please call if you are interested and we will do our best to accommodate your group. 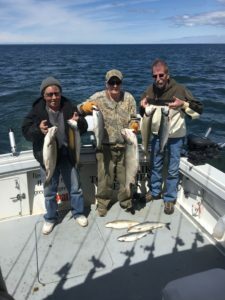 Remember don’t miss out on your trip of a lifetime, call us at 315-298-4291 and we will do our best to hook you up. I’ve just had 2 prime October dates open up, the 19th, 20th have just become available. 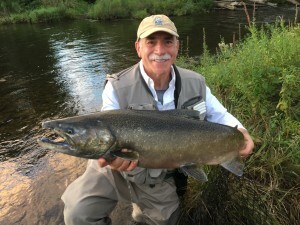 These are prime dates for both dime bright steelhead and possibly salmon on the salmon river here in Pulaski, NY..
On any of these 2 dates and angler can expect multiple hookups with these hard fighting fish. 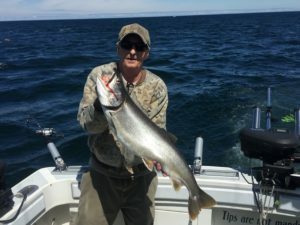 The fishing on the Eastern basin of Lake Ontario continues to be somewhat tough. 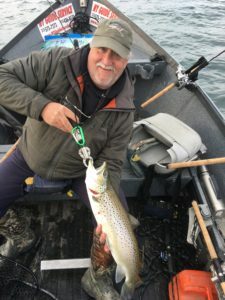 Most of the salmon that we are seeing are juveniles, and the Brown trout bite is spotty at best, although some of the Brown trout we are catching are mammoth. 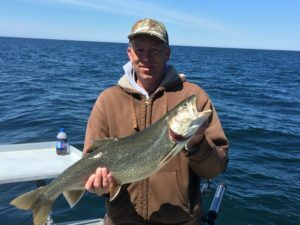 Lake trout fishing is still consistent with limit catches being taken daily. 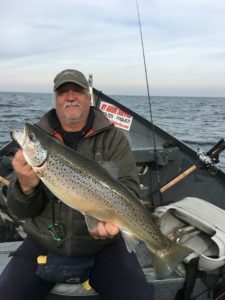 Reports from the Western end of the Lake are good it appears that there are plenty of fish and the reports that we are getting from our colleagues on the Canadian side of the lake are phenomenal. 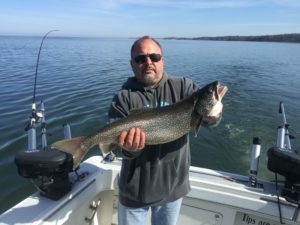 Contrary to reports issued by state of New York we certainly have no shortage of bait on this end of the lake given this I expect to see our Kings start moving in in approximately 2 to 3 weeks. 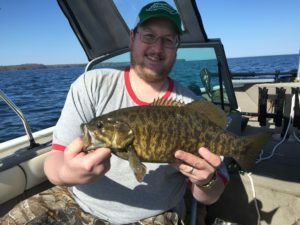 Lake Oneida is currently fishing well for walleyes and smallmouth bass. 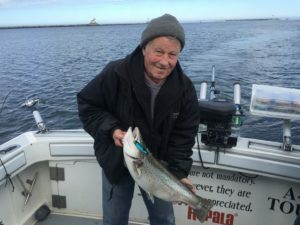 Limit catches have been the norm if one puts in their time. 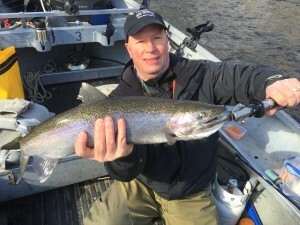 For those of you looking for a summer getaway we still have openings for the big Lake as well as Lake Oneida. Give us a call at 315-298-4291 and we will hook you up. 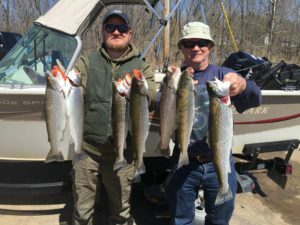 Well we are done with the River for the season. 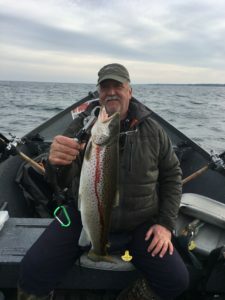 And it is now go time on Lake Ontario. 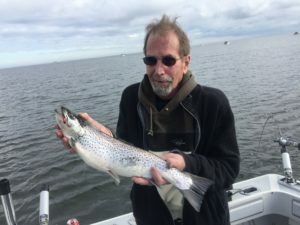 Fishing has been pretty decent with a mix of Brown trout, lake trout, steelhead along with the occasional Atlantic. 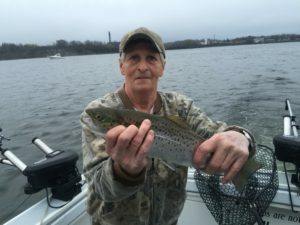 We also had our 1st king of the season on the line last Saturday but unfortunately after a lengthy battle he spit the lure and eluded capture. Our new home port for the seduction is now in Oswego, and we are ready to do battle at a moments notice. 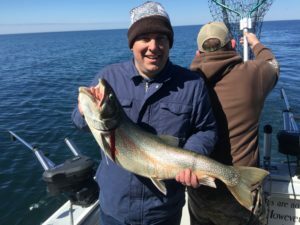 If you would like to enjoy world-class trophy fishing on our beautiful Lake give us a call at 315-298-4291 and we will get you on board and into some beautiful fish. 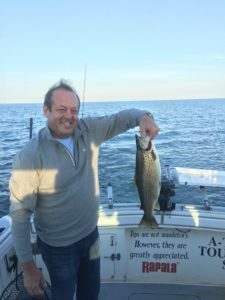 We offer multiple packages and pricing’s and also have other boats at our disposal to accommodate your larger groups. Sorry for the lack of recent reports, but we have been very busy with other projects. 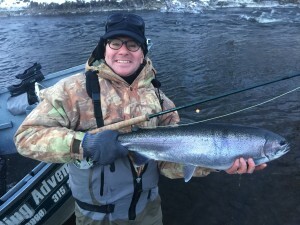 Regardless, as some of you may know the salmon River is still fishing very slow although If you put your time and you will most likely be rewarded with some beautiful steelhead and there is a light at the end of the tunnel. 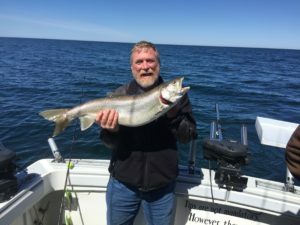 Upon speaking with hatchery personnel it appears that the numbers of fish in the hatchery and nursery waters of Beaver brook and the upper Salmon River are in fact very good. This being said we should expect to see an average to good spring dropback season. 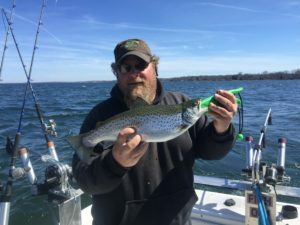 With the winter is milder as it has been the Lake is already setting up nicely for our spring Brown trout fishing opportunities and we are in the process of rigging the boats for that opportunity. Also I am happy to announce that we have a new boat in the flotilla that will give us the opportunity to properly expand our services to the Oswego River this is a custom-built Hyde powered by a 15 hp 4 stroke Yamaha engine. 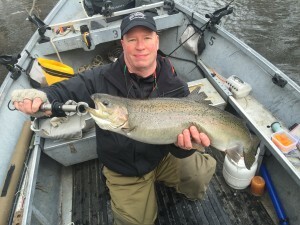 This will give our clients an option when the salmon River is not fishing up to our standards. 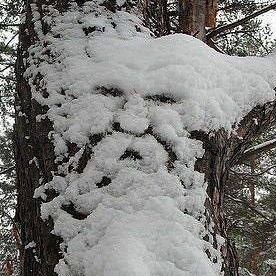 As old man winter watches over the salmon river here in Pulaski, NY. 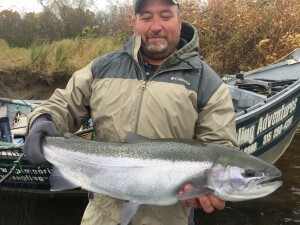 I’m happy to say that the higher water we’ve been blessed with has brought in even more Fresh Steelhead for us to enjoy. Most of us are seeing a half dozen hook ups or more on an average day, some days more some days less. 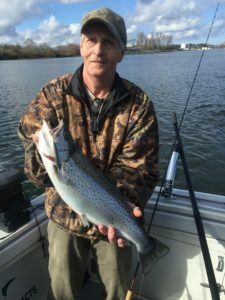 I’m also told that there are more than enough Steelhead in the race way and beaver brook to accommodate the hatchery in their egg taking needs for the spring, That being said we should be in good shape for our spring dropback fishing. We still have openings for March, April and early May so give us a call and we’ll hook you up ! 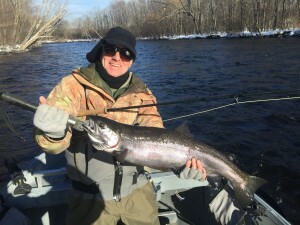 Another great day on the Salmon river, Beautiful weather and cooperative fish = happy client. 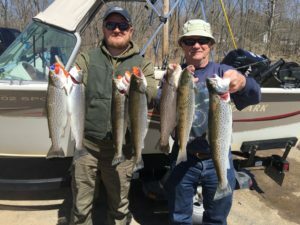 © 2019 Angling Adventures Lake Charter & River Guide Service Pulaski, NY.